An experimental vaccine protected 100 percent of animal models against the highly infectious and virulent bacterium, Clostridium difficile (image), which causes an intestinal disease that kills approximately 30,000 Americans annually. The research was published ahead of print on July 14, 2014 in Infection and Immunity. In the study, the vaccine protected the mice and non-human primates against the purified toxins produced by C. difficile, as well as from an orogastric spore infection, a laboratory model that mimics the human disease, after only two immunizations. "Animals that received two immunizations did not get sick or show signs of C. difficile-associated disease," says corresponding author Michele Kutzler, Ph.D., of Drexel University College of Medicine, Philadelphia. "While our research was conducted in animal models, the results are very translatable to the clinic," says Dr. Kutzler. "In some cases, patients who acquire C. difficile can develop serious complications including severe diarrhea, toxic megacolon, bowel perforation, multi-organ failure, and death. Once fully developed, our DNA vaccine could prevent the deadly effects of C. difficile infection when administered to hospital patients at risk of acquiring C. difficile." The protection following just two immunizations is especially important because the time window in humans between colonization with C. difficile and the onset of disease symptoms can be a mere 10-14 days, says Dr. Kutzler. The vaccine protects against the bacterial toxins by mustering anti-toxin neutralizing antibodies, says Dr. Kutzler. The cost of fighting the half million C. difficile infections that occur annually in the U.S. is estimated to be nearly $10 billion, most of which could be saved by a successful preventive vaccine, says Dr. Kutzler. Going to the dentist isn't fun for anyone, but for those with periodontal disease related to type 2 diabetes, a new research discovery may have them smiling. In a report appearing in the August 2014 issue of the Journal of Leukocyte Biology, one of the most important blood cells involved in the human immune response, B cells (image), are shown to promote inflammation and bone loss in type 2 diabetes-associated periodontal disease. These findings support the idea that treatments that manipulate the responses of B cells may treat or prevent this complication. "Our study identified common inflammatory mechanisms shared by type 2 diabetes and periodontal disease. It paves the way for the development of novel therapeutics which aim to simultaneously treat both type 2 diabetes and its complications," said Min Zhu, Ph.D., a researcher involved in the work from the department of microbiology at Boston University School of Medicine in Boston, Massachusetts. To make this discovery, scientists used an experimental model (mouse model) of periodontal disease and applied it to two groups. The first group had a genetic alteration that knocked out all B cells. The second group had normal B cell levels. When fed a low-fat diet, without development of obesity and type 2 diabetes, both groups demonstrated a similar extent of oral bone loss and inflammation. However, when they were fed a high-fat diet, became obese, and developed type 2 diabetes, oral bone loss and inflammation occurred in the normal group with B cells, but did not develop in the group with the altered gene to knock out the B cells. This suggests that the B cell-response might be a viable target for pharmacological intervention in both type 2 diabetes and periodontal disease, as well as potentially in other type 2 diabetes complications. Printing whole new organs for transplants sounds like something out of a sci-fi movie, but the real-life budding technology could one day make actual kidneys, livers, hearts, and other organs for patients who desperately need them. In the American Chemical Society journal Langmuir, scientists reported online on July 8, 2014 new understanding about the dynamics of 3-D bioprinting that takes them a step closer to realizing their goal of making working tissues and organs on demand. Yong Huang and colleagues note that this idea of producing tissues and organs, or biofabricating, has the potential to address the shortage of organ donations. And biofabricated organs and tissues could even someday be made with a patient's own cells, lowering the risk of rejection. Today, more than 120,000 people are on waiting lists for donated organs, with most needing kidney transplants. But between January and April of this year, just short of 10,000 people received the transplant they needed. There are a few different biofabricating methods, but inkjet printing has emerged as a frontrunner. It's been used to print live cells, from hamster ovary cells to human fibroblasts, which are a common type of cell in the body. But no studies had been done to really understand how biological inks behave when they're dispensed through printer nozzles. Huang's team set out to fill that gap. They tested bioinks with different concentrations of mouse fibroblasts plus a hydrogel made out of sodium alginate. They discovered, among other findings, that adding more cells in the material reduces both the droplet size and the rate at which it gets dispensed. The new results will help scientists move forward with this promising technology. 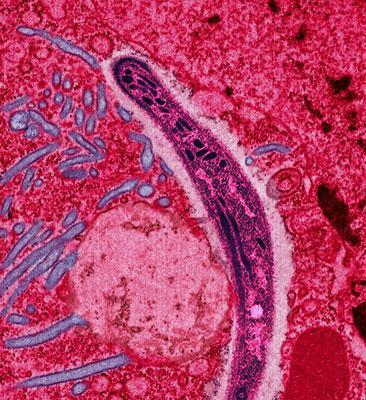 Resistance to artemisinin, the main drug to treat malaria, is now widespread throughout Southeast Asia, among the Plasmodium falciparum (P. falciparum) parasites (image) that cause the disease and is likely caused by a genetic mutation in the parasites. However, a six-day course of artemisinin-based combination therapy—as opposed to a standard three-day course—has proved highly effective in treating drug-resistant malaria cases, according to findings published today in the July 31, 2014 issue of the New England Journal of Medicine. The research was conducted by an international team of scientists including those from the National Institute of Allergy and Infectious Diseases (NIAID), part of the National Institutes of Health. Previous clinical and laboratory studies suggest that P. falciparum parasites with a mutant version of a gene called K13-propeller are resistant to artemisinin. In the new study, researchers found that the geographic distribution of these mutant parasites in Western Cambodia corresponded with the recent spread of drug resistance among malaria patients in that region. Although artemisinin continued to effectively clear malaria infections among patients in this region, the parasites with the genetic mutation were eliminated more slowly, according to the authors. Slow-clearing infections strongly associated with this genetic mutation were found in additional areas, validating this marker of resistance outside of Cambodia. Artemisinin resistance is now firmly established in areas of Cambodia, Myanmar, Thailand, and Vietnam, according to the authors. As a potential treatment, the researchers tested a six-day course of artemisinin-based combination therapy in Western Cambodia and found the regimen to be effective in this region, where resistance has become the most problematic. A new study by researchers at Sanford-Burnham Medical Research Institute (Sanford-Burnham) in La Jolla, California, has found that a peptide called caerulein can convert existing cells in the pancreas into those cells destroyed in type 1 diabetes-insulin-producing beta cells. The study, published online July 31, 2014 open-access article in Cell Death and Disease, suggests a new approach to treating the estimated 3 million people in the U.S., and over 300 million worldwide, living with type 1 diabetes. "We have found a promising technique for type 1 diabetics to restore the body's ability to produce insulin. By introducing caerulein to the pancreas, we were able to generate new beta cells—the cells that produce insulin—potentially freeing patients from daily doses of insulin to manage their blood-sugar levels." said Fred Levine, M.D., Ph.D., professor and director of the Sanford Children's Health Research Center at Sanford-Burnham. The study first examined how mice in which almost all beta cells were destroyed—similar to humans with type 1 diabetes—responded to injections of caerulein. In those mice, but not in normal mice, they found that caerulein caused existing alpha cells in the pancreas to differentiate into insulin-producing beta cells. Alpha cells and beta cells are both endocrine cells meaning they synthesize and secrete hormones—and they exist right next to one another in the pancreas in structures called islets. However, alpha cells do not normally become beta cells. The research team then examined human pancreatic tissue from type 1 diabetics, finding strong evidence that the same process induced by caerulein also occurred in the pancreases of those individuals. Babies who are born with severe combined immunodeficiency (SCID) can be successfully treated with a transplant of blood-forming stem cells, according to experts led by Memorial Sloan Kettering’s (MSK’s) Richard J. O’Reilly, M.D., a world-renowned pioneer in the development of transplant protocols. Their review will be published in the July 31, 2014 issue of the New England Journal of Medicine. SCID is a group of inherited disorders that cause the immune system to severely malfunction. When this breakdown occurs, babies no longer have the ability to fight off routine infections because their natural, built-in defense system has been damaged. If undiagnosed or left untreated, SCID is almost always fatal within the first year of life. A review of more than 240 patient cases found transplants to be quite effective, especially when performed early in life. Of those children receiving transplants within three and a half months after birth, 94 percent were alive five years later. The best results, not surprisingly, were seen after transplant from “matched sibling” donors. But among patients who didn’t have a matched sibling, overall five-year survival rates were quite high — 77 to 93 percent — if they were transplanted in the first three and a half months of life. “This confirms that transplants for SCID work well in very young children, but it also shows that any child with this disease can be treated with a high likelihood of a cure with a transplant from a parent or unrelated donor, not just a matched brother or sister,” explained Dr. O’Reilly, Chair of MSK’s Pediatrics Department and Chief of the Pediatric Bone Marrow Transplant Service. Johns Hopkins researchers say they have discovered a chemical alteration in a single human gene linked to stress reactions that, if confirmed in larger studies, could give doctors a simple blood test to reliably predict a person's risk of attempting suicide. The discovery, described online on July 30, 2014 in The American Journal of Psychiatry, suggests that changes in a gene involved in the function of the brain's response to stress hormones plays a significant role in turning what might otherwise be an unremarkable reaction to the strain of everyday life into suicidal thoughts and behaviors. 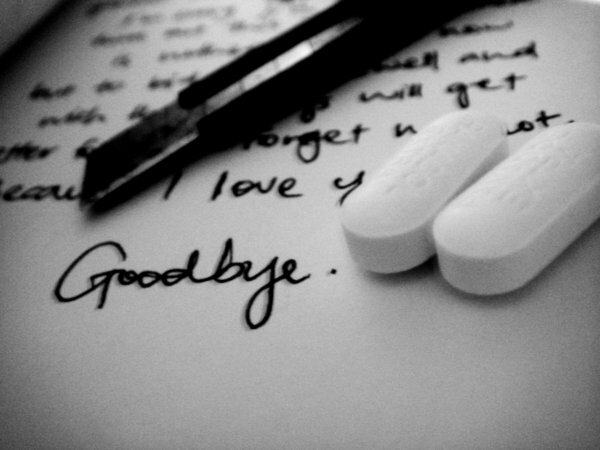 "Suicide is a major preventable public health problem, but we have been stymied in our prevention efforts because we have no consistent way to predict those who are at increased risk of killing themselves," says study leader Zachary Kaminsky, Ph.D., an assistant professor of psychiatry and behavioral sciences at the Johns Hopkins University School of Medicine. "With a test like ours, we may be able to stem suicide rates by identifying those people and intervening early enough to head off a catastrophe." For his series of experiments, Dr. Kaminsky and his colleagues focused on a genetic mutation in a gene known as SKA2. By looking at brain samples from mentally ill and healthy people, the researchers found that in samples from people who had died by suicide, levels of SKA2 were significantly reduced. Within this common mutation, they then found in some subjects an epigenetic modification that altered the way the SKA2 gene functioned without changing the gene's underlying DNA sequence. The modification added chemicals called methyl groups to the gene. Higher levels of methylation were then found in the same study subjects who had killed themselves. The higher levels of methylation among suicide decedents were then replicated in two independent brain cohorts. Researchers at Cold Spring Harbor Laboratory (CSHL) have discovered a new function of the body's most important tumor-suppressing protein. Called p53 (image), this protein has been called "the guardian of the genome." It normally comes to the fore when healthy cells sense damage to their DNA caused by stress, such as exposure to toxic chemicals or intense exposure to the sun's UV rays. If the damage is severe, p53 can cause a cell to commit preprogrammed cell-suicide, or apoptosis. Mutant versions of p53 that no longer perform this vital function, on the other hand, are enablers of many different cancers. Cancer researcher Dr. Raffaella Sordella, Ph.D., a CSHL Associate Professor, together with colleagues, report today (July 29, 2014) online in PNAS the discovery of a p53 cousin they call p53-psi. It is a previously unknown variant of the p53 protein, generated by the same gene, called TP53 in humans, that gives rise to other forms of p53. Dr. Sordella and colleagues observed that p53-psi, when expressed, reduces the expression of a molecular glue called E-cadherin, which normally keeps cells in contact within epithelial tissue, the tissue that forms the lining of the lung and many other body organs. This is accompanied by expression of key cellular markers associated with tumor invasiveness and metastatic potential. (These are markers of EMT, or epithelial-to-mesenchymal transition.) Consistently, Dr. Sordella and her team found levels of p53-psi to be elevated in early-stage lung tumors with poor prognosis. Careful investigation revealed that p53-psi generates pro-growth effects by interacting with a protein called cyclophillin D (CypD), at the membrane of the cell's energy factories, the mitochondria, and by spurring the generation of oxidizing molecules called reactive oxygen species (ROS). Research conducted at the Florida campus of The Scripps Research Institute (TSRI) has discovered links between a set of genes known to promote tumor growth and mucoepidermoid carcinoma, an oral cancer that affects the salivary glands. The discovery could help physicians develop new treatments that target the cancer’s underlying genetic causes. Baseball Hall of Famer Tony Gwynn (image) recently died from complication of salivary gland cancer at the age of 54, bringing this disease into national prominence and, in his case, was widely attributed to the lengthy use of chewing tobacco. The new research, recently published online ahead of print on July 28, 2014 by PNAS, shows that a pair of proteins joined together by a genetic mutation—known as CRTC1/MAML2 (C1/M2)—work with MYC, a protein commonly associated with other cancers, to promote the oral cancer’s growth and spread. “This research provides new insights into the molecular mechanisms of these malignancies and points to a new direction for potential therapies,” says TSRI biologist Michael Conkright, Ph.D., who led the study. The C1/M2 protein is created when the genes encoding CRTC1 and MAML2 mutate into a single gene through a process known as chromosomal translocation. Such mutant “chimera” genes are linked to the formation of several forms of cancer. The team discovered that the C1/M2 protein further activates genetic pathways regulated by MYC, in addition to CREB, to begin a series of cellular changes leading to the development of mucoepidermoid carcinoma. “The identification of unique interactions between C1/M2 and MYC suggests that drugs capable of disrupting these interactions may have therapeutic potential in the treatment of mucoepidermoid carcinomas, ” said Antonio L.
University of Texas (UT) Southwestern Medical Center cancer researchers have found a molecule that selectively and irreversibly interferes with the activity of a mutated cancer gene common in 30 percent of tumors. 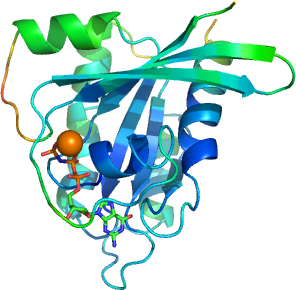 The molecule, SML-8-73-1 (SML), interferes with the KRAS gene, or Kirsten rat sarcoma viral oncogene homolog. The gene produces proteins called K-Ras (image) that influence when cells divide. Mutations in K-Ras can result in normal cells dividing uncontrollably and turning cancerous. These mutations are found particularly in cancers of the lung, pancreas, and colon. In addition, people who have the mutated gene are less responsive to therapy. Researchers have unsuccessfully tried to develop a drug to inhibit K-Ras for some 30 years. “RAS proteins including KRAS have not been ‘druggable’ for many decades despite a lot of effort from academia and industry,” said senior author Kenneth Westover, M.D., Ph.D, Assistant Professor of Radiation Oncology and Biochemistry, and a member of UT Southwestern’s Harold C. Simmons Cancer Center. “We are exploring irreversible inhibitors as a solution, which we believe may pave the way for the development of KRAS-targeted compounds with therapeutic potential and perhaps compounds that target other RAS family proteins involved in cancer,” Dr. Westover said. Dr. Westover works as both a clinician as a member of the Lung Radiation Oncology Team at the Simmons Cancer Center, and as a researcher. The Westover laboratory investigates the molecular basis of cancer with an eye toward developing compounds that perturb cancer biology, and therefore have potential to become therapies. Dr. Westover’s lab has been particularly targeting KRAS because this gene is the most commonly mutated oncogene in cancer. Building on previous work, Dr.